Seaside Growers Nursery produces and sells quality plants ranging from drought-tolerant succulents and grasses to palms and tropical plants. Come browse our sunny succulent and water wise plant area or stroll through the shade house loaded with palms, ferns, cycads, house and office plants, plus unique plants of many textures and colors. The Nursery also has a nice selection of general ornamentals, trees, privacy hedges, bamboo, vines and seasonal specialties including plumeria. Seaside Growers Nursery, located in San Juan Capistrano, is open to the public and welcomes both homeowners and contractors. Local deliveries are available. Explore our feature links below or use the menus at top and bottom. 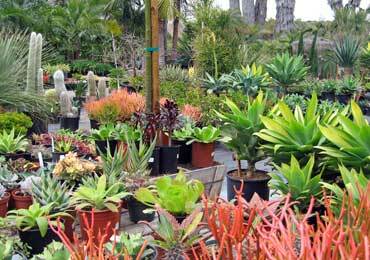 Seaside Growers Nursery provides many California Friendly Plants for water conserving landscapes and rebate programs. 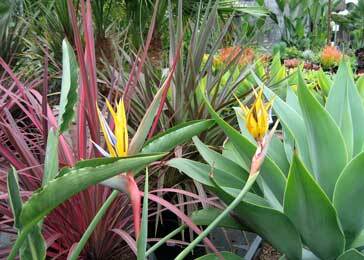 Great plants at the best prices in South Orange County. Come save money at the 20% off plant sale. Come visit and see our selections of succulents, California Friendly Plants, shrubs, trees, grasses, hedges, vines, tropicals, house plants, ferns, palms, cycads and much more. Conveniently located in southern San Juan Capistrano by Costco. Click for a map, directions and a preview of our entrance driveway for new visitors. The Succulents bring color, texture and style to the garden while saving water. Come take a look. We are really good at what we do but, we don’t have all the things found in larger nursery garden centers. Take a peek to see things we do not have.